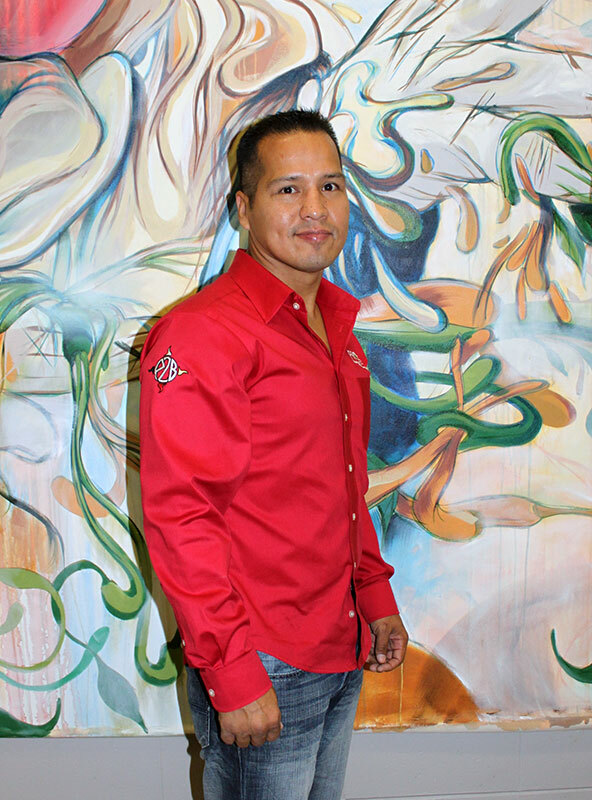 Earl Lambert, a Cree Metis Warrior and motivational speaker, opens students and teachers minds with the teachings of the medicine wheel during A Journey Towards Wellness on Oct. 23. The crowd was emotionally touched by the lessons shared by Cree-Metis Warrior and motivational speaker Earl Lambert during A Journey Towards Wellness on Oct. 23 at Trafalgar Campus. His talk showed students and teachers a new way to approach wellness through First Nations culture, the teachings of the medicine wheel and how they are applied in their lives. The medicine wheel is a circle with four different colours, white, yellow, red and black. The event was organized by the Aboriginal Initiatives Office in keeping with the theme of this year’s President’s Creative Challenge. “The Challenge this year is mind, body, spirit, wellness, which doesn’t get any more First Nations because that is the medicine wheel,” said Paula Laing, a student success and transition advisor for the Aboriginal Initiatives Office. Lambert used visual displays and magic tricks to show how the medicine wheel represents the different stages of life, the four sacred elements and the four nations (Africa, Asia, Indigenous and Europeans) reunite in peace and tranquility. The teachings can also be used to achieve wellness and balance in our lives physically, mentally, emotionally and spiritually. “If we do not fuel ourselves with food, exercise, take care of our body, nurture the mind, honour the spirit of creation or emotionally express ourselves then we don’t feel so good,” said Lambert. The presentation included teachings about finding and knowing your worth, being confident and optimistic, having pride in yourself and not being ashamed of whom you are. According to Lambert, fear is false evidence appearing real and it is all in your head, but courage is in your heart. 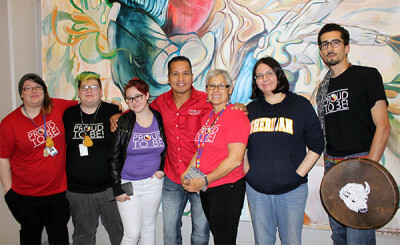 Sera and Robyn Bailey, first-year Social Service Worker students, Kayla Parisien, a first year Social Service Worker, Earl Lambert, a Cree Metis Warrior and motivational speaker, Paula Laing, a student success and transition advisor for the Aboriginal Initiatives Office, Angel Pangowish, a first year Art Fundamentals student and Moh’Ku Sayeed, a second year Social Service Worker Gerontology student. Whether students and teachers were curious about the medicine wheel and that approach to health or trying to include Aboriginal culture and teachings back into the curriculum, everyone had their minds opened. “I’m very grateful and glad that Earl was able to make it out and share his story and these very valuable teachings,” said Moh’Ku Sayeed, a second-year Social Service Worker Gerontology student. According to Lambert, everything is interconnected and it’s got to work together because nothing is separate. We are all equal and nobody is better than the other. “I felt everything he said resonated with the idea that all the worlds and people are coming together and the new youth are saying lets just move on and get along,” said Laing. Added by Elise Morton on November 4, 2015.